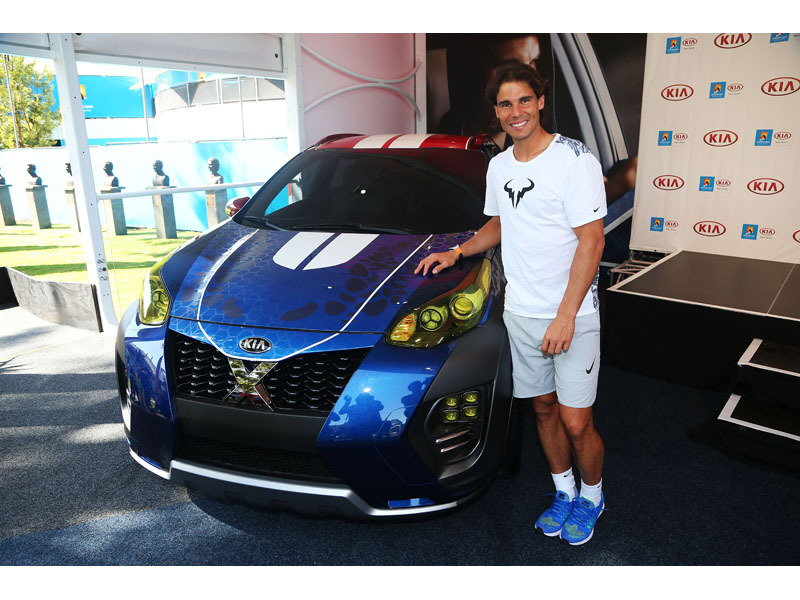 Tennis superstar and Kia global brand ambassador Rafael Nadal lifted the cover off of Kia's latest 'X-Car' today in Melbourne, Australia during the official VIK handover ceremony for the Australian Open 2016. The one-of-a-kind Sportage CUV was created in collaboration with Twentieth Century Fox and modelled after the popular X-Men character Mystique. Boasting a unique design with special textured 'tone-on-tone' matte and gloss blue paint finish, racing wheels and tires along with red and yellow bodywork highlights, the Kia X-Car and Rafael Nadal combine powers in an online video released ahead of this year's Australian Open. Widely regarded as the greatest left-handed tennis player ever, the secret of Nadal's right arm is revealed in the video which can be viewed at http://tinyurl.com/gr4ek7d. The Sportage-based Kia X-Car is the company's second show car project in collaboration with Fox, following the Wolverine-inspired Sorento that was shown at the Australian Open 2015. Today's ceremony also featured the handover of 110 official courtesy vehicles to the Australian Open Organizing Committee. The fleet will be driven by approximately 225 specially trained volunteer drivers and cover more than 300,000 kilometers to transport players, officials, event staff, fans, VIPs and media representatives throughout the duration of the tournament. Tennis Australia CEO, Craig Tiley, said, "Kia makes an incredible contribution to the running of the Australian Open and I'm again very pleased to accept the key to the 100-plus fleet of Kia courtesy vehicles. The sight of the Kia cars ferrying players, officials, media and this year for the first time, fans, around Melbourne, adds significantly to the tangible excitement and buzz the event brings to the city of Melbourne. "The majority of the 110-strong courtesy fleet – 52 vehicles – is made up of midsize Sorento CUV. Also comprising the fleet are 30 Kia's Carnival MPVs (known as 'Sedona' in North America) and 28 C-segment Cerato sedans (known 'Forte' or 'K3' in some markets).